There are two classes of vehicles out there: the kind that needs to be thoroughly reworked, and the kind that needs to be left untouched because it’s already pretty darn good. I recently had the chance to hop behind the wheel of a vehicle that falls into the latter category, the 2019 Mazda MX-5. 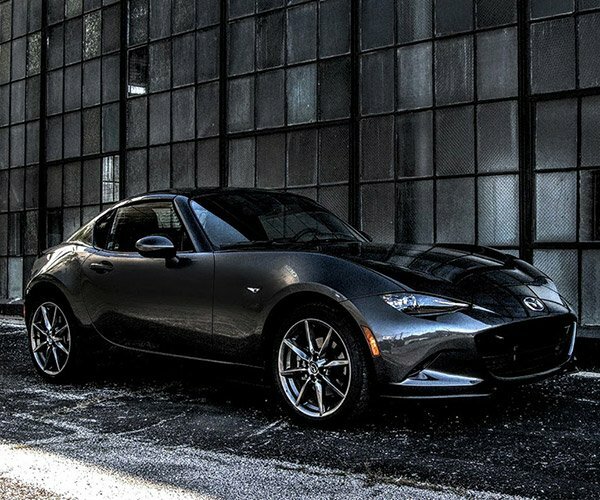 For 2019, Mazda got to work on several fronts that they believed would improve the MX-5 driving experience. You know, the quintessential wind in your hair and hug the road kind of feeling. 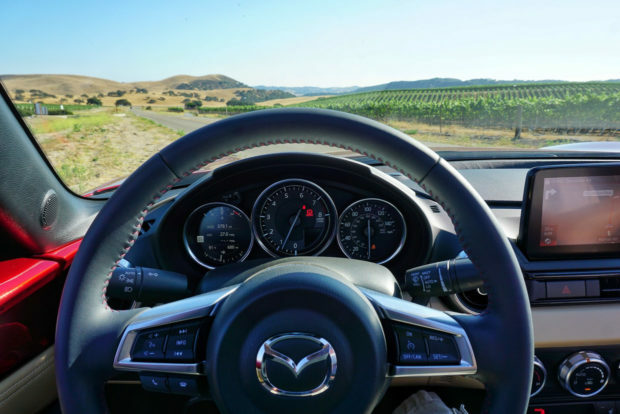 As a result, Mazda awarded it more power than its predecessor, now 181 ponies compared to 155, made it more comfortable by adding a telescoping steering column, and added a range-topping GT-S trim to make sure new and repeat owners get the exact equipment they want directly from the factory. 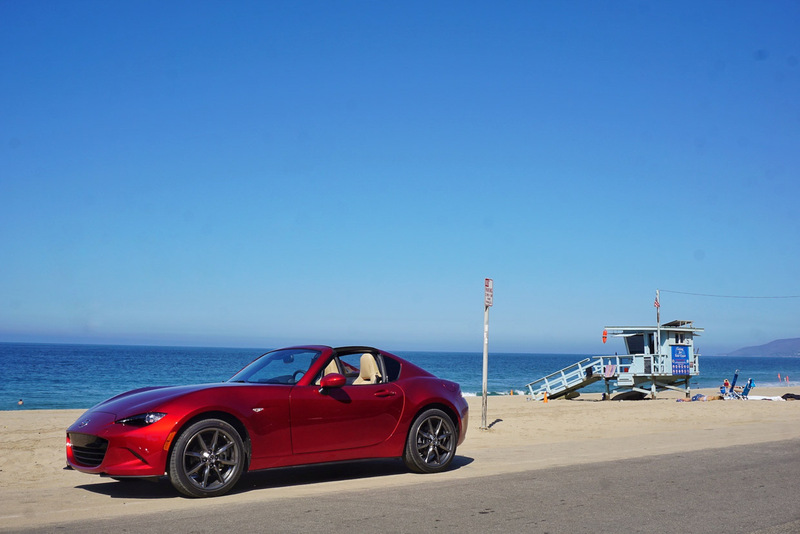 These changes, along with the MX-5 core recipe, came to life during a 600-mile road trip along Southern California’s most iconic roads. From the busy streets of San Diego to the exhilarating roads near Malibu and the scenic coastal highways of Pismo Beach, the agile two-seater was the protagonist of a lovely story written heavy with nostalgia. After all, it was during the early ‘90s that Miata aficionados got together and found out just how much fun these little guys were away from the hustle and bustle of civilization. So, in many ways, this was the “remastered version” of the original Miata summer road trip. I’ll start by addressing the elephant in the room: the increased horsepower. Yes, the 2019 MX-5 generates more power than ever, but raw power has never been the MX-5’s secret sauce—that’s been balance. Along with 26 more horsepower, Mazda also increased the redline from 6,800 to 7,500 rpm to allow the 2.0-liter four-cylinder engine to generate more power earlier on and throughout the entire rev range. This first became noticeable when I tried to escape the stop-and-go traffic of San Diego’s downtown streets but merged into the stop-and-go traffic of San Diego’s highways instead. Need to pass? Forget about downshifting. Fourth; fifth; sixth gear; there was power to be enjoyed anywhere above 2,000 rpm. In fact, while cruising on the highway at 80 miles per hour in fifth gear (about 3,000 rpm) the MX-5 had just as much oomph as it did in fourth gear at over 4,000 rpm. 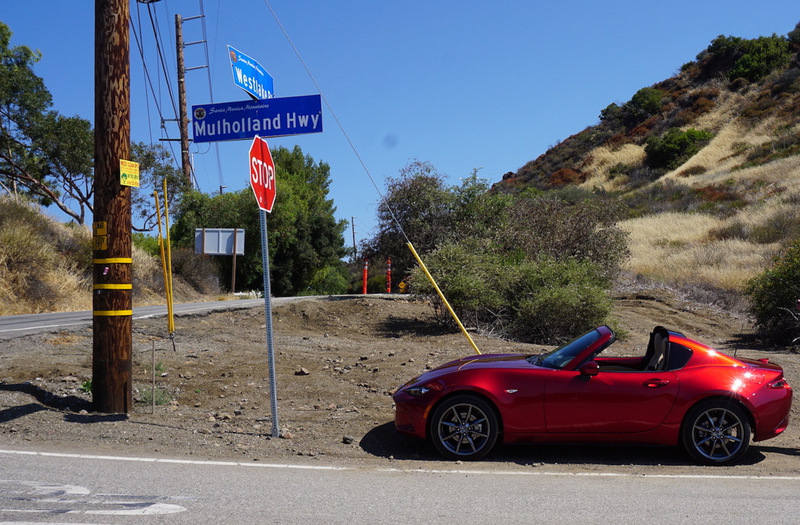 In the nausea-emitting twisties of Mulholland on the hills of Malibu, the horsepower increase was also evident in the form of a wider power and torque band that allowed the MX-5 to feel more stable and confident. Unlike the previous drivetrain configuration, third gear could tackle almost any canyon road without showing any signs of running out of juice. Mazda did have an automatic transmission on hand, but I opted for the traditional six-speed. 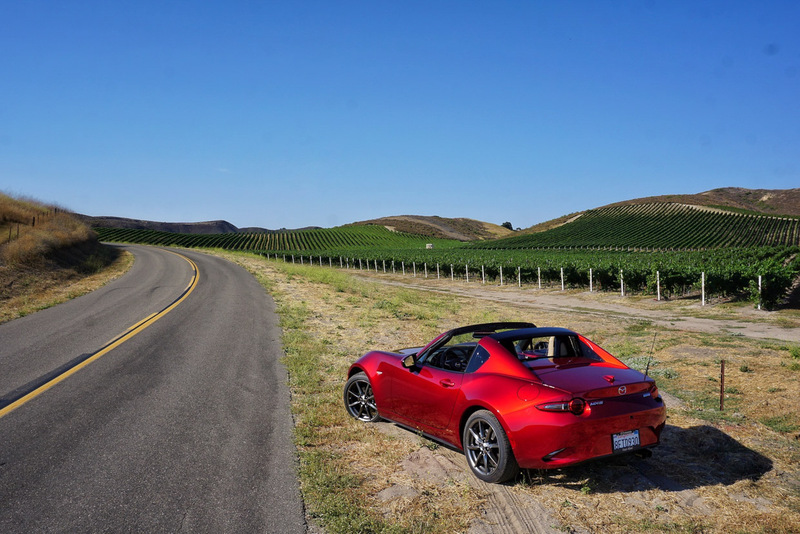 The first half of my adventure took place in the MX-5 soft-top, and the second in the sleek and drool-worthy “RF” model, which stands for retractable fastback. Although the two are virtually equal, the cabin of the RF felt a bit more cramped in terms of headroom and legroom. 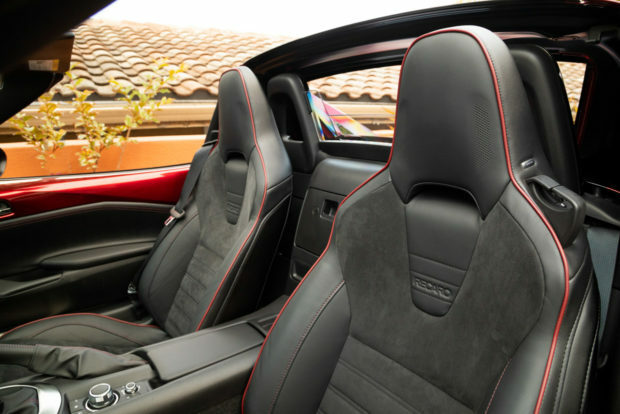 It’s almost as if the wall behind the seats was pushed forward an inch to make room for the hardtop. According to Mazda, there are 0.6 inches less of headroom in the RF but claim that legroom and hip room remain equal across both models. 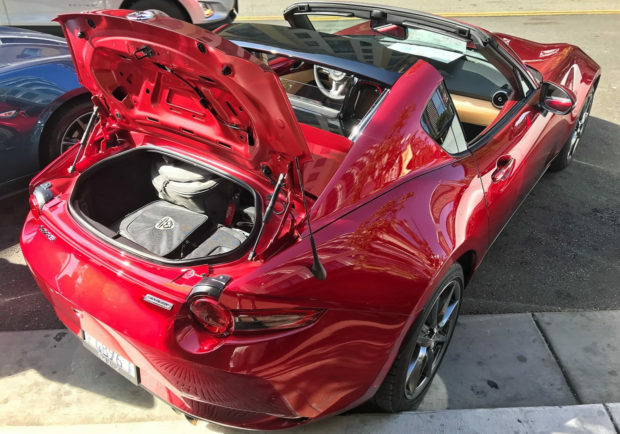 And speaking of room, or the lack of it, the RF boasts 4.48 cubic feet of cargo space, while the roadster makes ends meet with 4.59. In other words, I could fit my roller suitcase, backpack, camera bag, and my drive partner’s briefcase in the trunk, but his carry-on-sized suitcase had to ride in a support vehicle. My advice? Pack lightly. 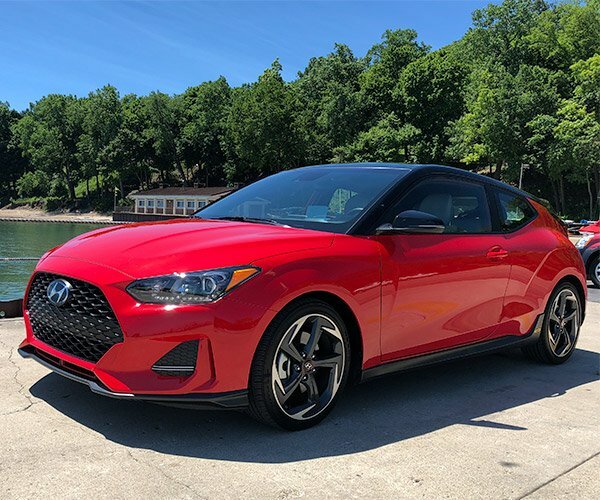 The length and configuration of my point-to-point road trip were perfect for exploring the dynamics of the updated drivetrain, but also for enjoying (and appreciating) the new interior refinements. As someone who has relatively long legs and somewhat short arms, the newly installed telescoping steering column is a lifesaver. The driver’s seat already offered enough range of adjustment to set a comfortable position for my legs, but now I can also adjust the steering wheel in a way that my shoulders don’t feel sore after a long drive. While this may sound like a simple add-on, Mazda spent considerable time designing an aluminum column extension that only added 0.45 pounds to the car’s curb weight. It’s worth mentioning that the two vehicles I drove weren’t equipped with the optional Recaro sports seats, something I’m secretly grateful for because their bolsters don’t bode well with my extra-large frame, but in regard to the stock leather seats of the MX-5’s GT trim, they are a darling whether you’re thick, thin, short, or tall. Sure, track-day enthusiasts may opt for the Recaros – but I’m here to tell you that they’re not needed for most driving scenarios. 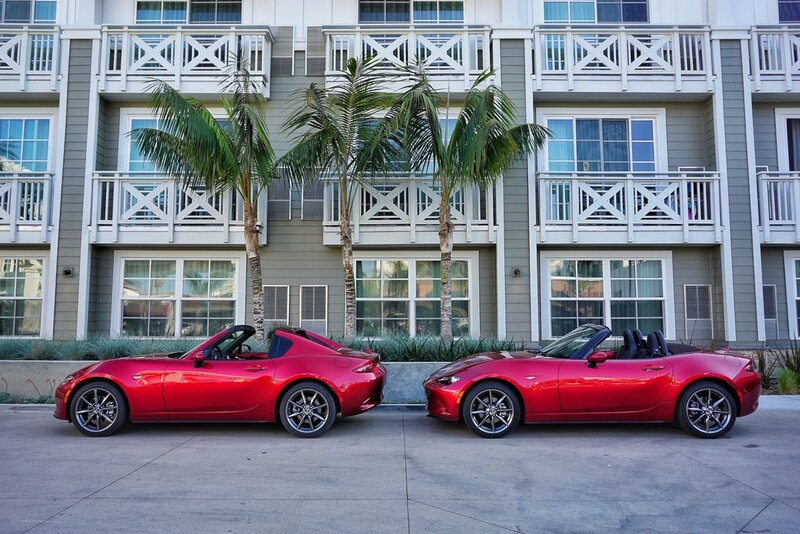 The cabin of the MX-5 remains largely unchanged, which isn’t a bad thing at all. 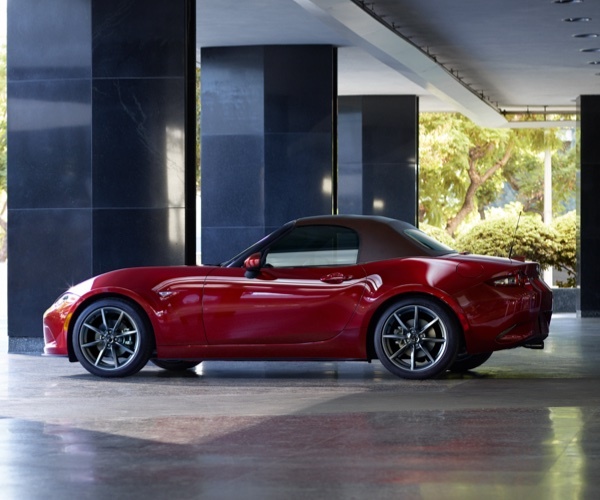 The driver-centric seating position remains, the easy-to-use infotainment system is still there, although now it includes a standard backup camera, and the signature Miata cupholders still sit by the elbows. However, Mazda still hasn’t integrated Apple CarPlay or Android Auto to the Miata’s operating system (though it has made its way to the new Mazda6), and the USB power outlets failed to provide my iPhone with enough juice to charge it at times. 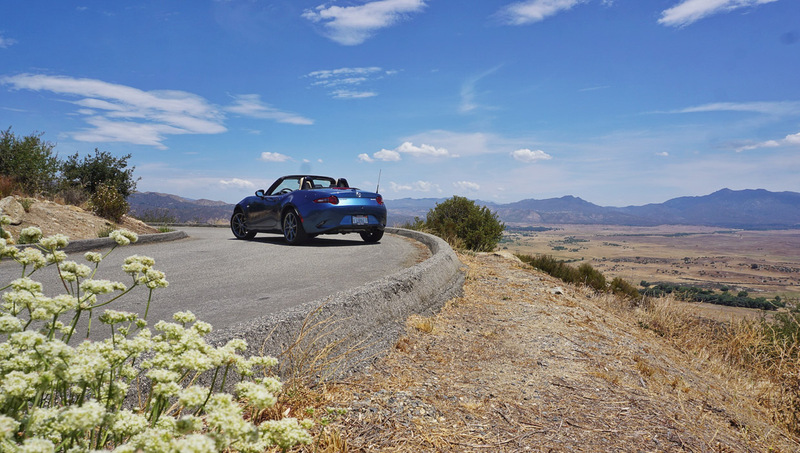 After spending nearly 20 hours over the course of two days at the wheel (or passenger seat) of the 2019 MX-5, I can safely say that it is better than the outgoing model. 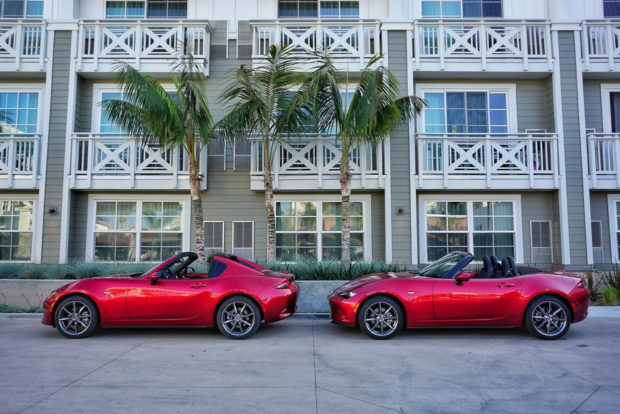 It’s evident that Mazda put in a lot of hard work to make sure it wasn’t just “more power” that defined the new MX-5, but a plethora of small refinements that amounted to an exquisite overall package, and that’s exactly what they’ve done. 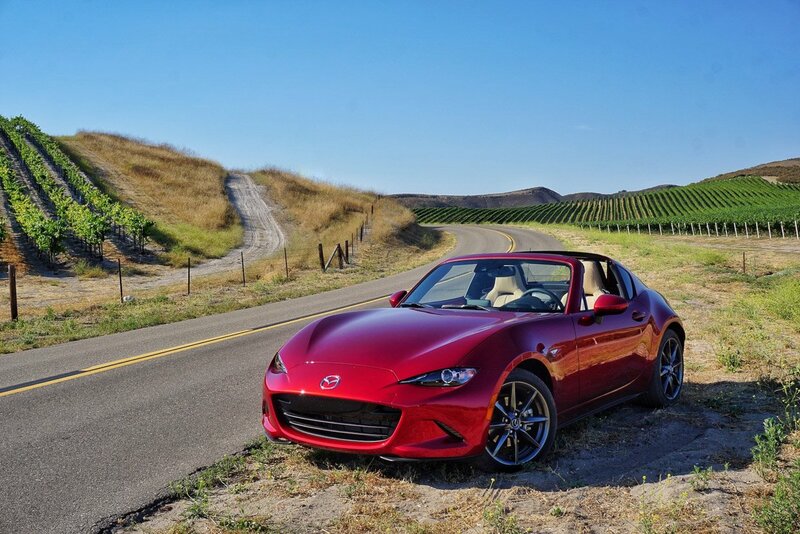 The 2019 Mazda MX-5 RF starts at: $33,240 (including $895 destination fee).